I had no birds for my posts this week so phoned up my friends Sarah and Graham. 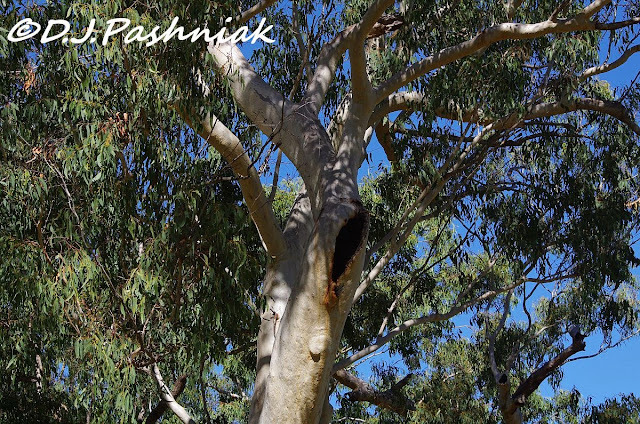 Of course I was invited to morning tea - good conversation and good company - and birds to photograph afterwards! Their yard has lots of big old gum trees which the birds love. 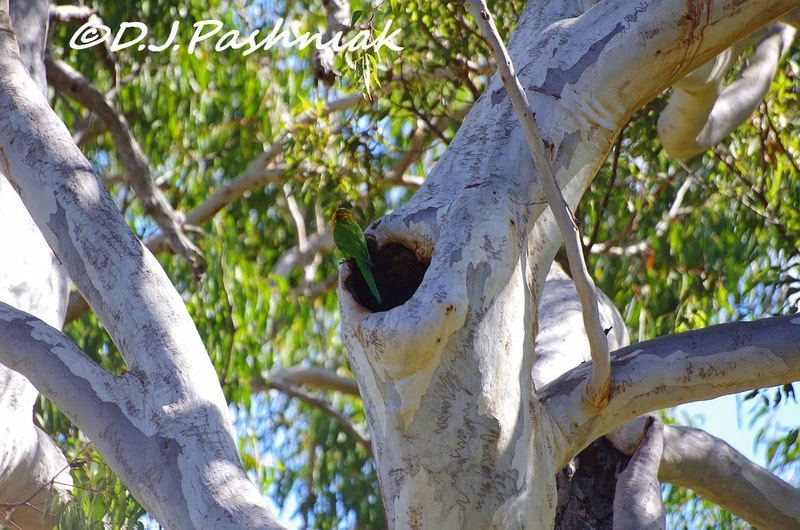 This morning there were numbers of parrots all inspecting possible nesting holes. All these big trees seem to have numbers of holes. It's just a matter of finding the right one! Some of the holes are a little harder to see than others. It seemed that the Rainbow Lorikeets were investigating the possibilities of this one. I could just imagine their deliberations! "Get involved! You know it needs to be a joint decision!" "Preening is hardly relevant when we are house hunting!" "Shouldn't we get a closer look?" "Would the inside be big enough for a family?" In the end they both flew off. I don't know it they didn't like the possibilities or they didn't like me photographing them from all angles. There were plenty more options to choose from! I do love all of your COLORFUL birds, Mick!!! And definitely hooray for great friends!! Thanks, as always, for sharing the beauty!! Have a great week!! 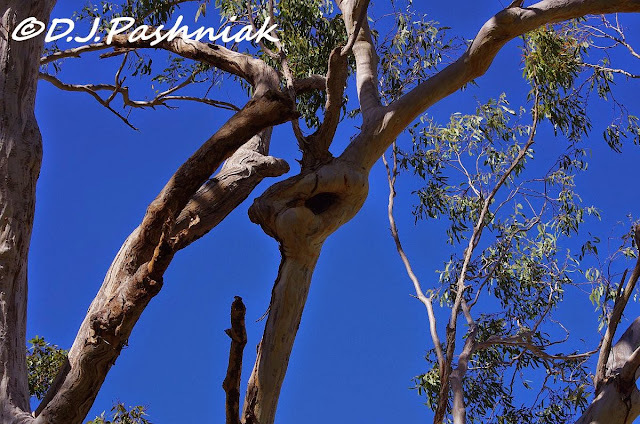 What interesting trees! And love the parrots! Such beautiful birds! 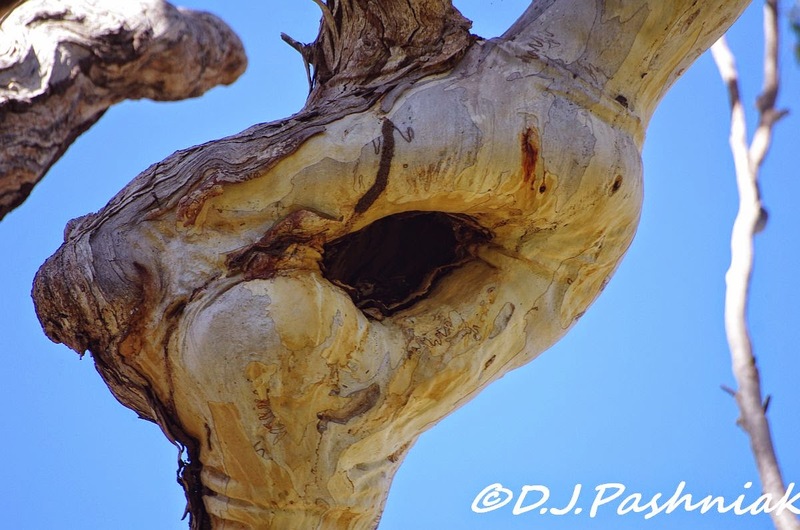 I wonder if they will return to that tree hole at a later date and make a nest? Great captures of those beautiful birds and wonderful Gum tree! What gorgeous shots - and amusing words! I'd go for #3. An older home but loads of character, a good neighborhood, and a great view. What beautiful shots! One of my favourite parrots. I think they should move into the last one. 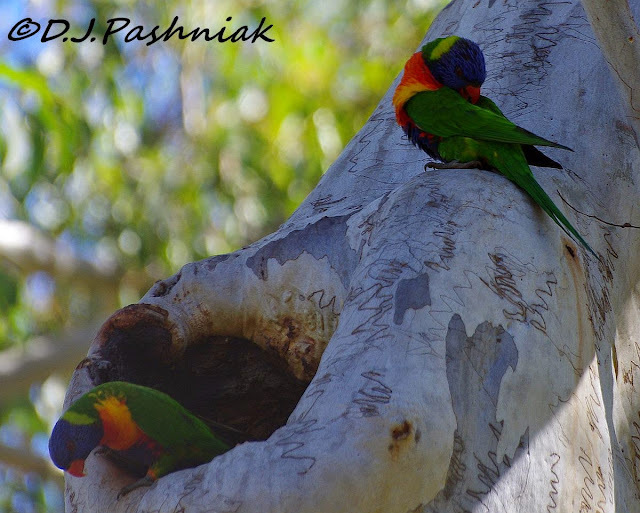 Great series of beautiful Rainbow Lorikeets. Brilliant series of house hunting shots. How can your spirits not be raised just watching those colourful birds. WOW! this is a wondeful series of photogrpahsof these very colourful birds and I love the words that go along with the shots. How amazing to live somewhere that you can see wild parrots! Here, we have to go to aviaries to see the rainbow lorikeets. 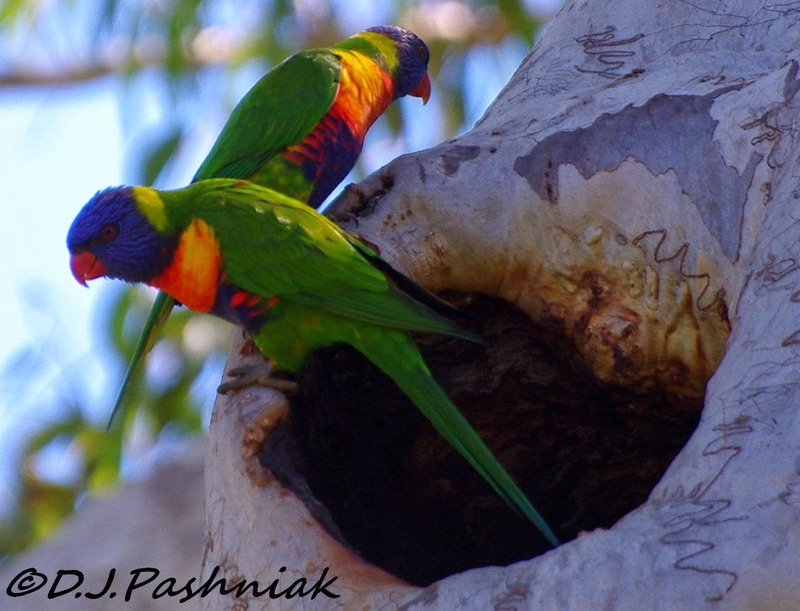 They are one of my favorite of all the parrots - so bright and colorful! Very nice sequence of shots. The birds are very colorful. 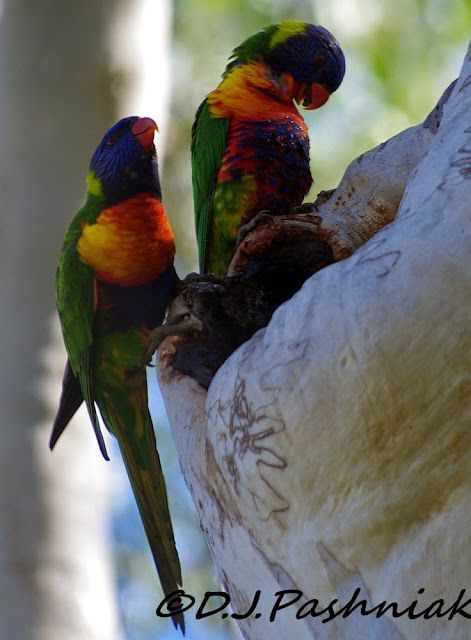 Cool post, I hope they all find their happy homes.. Love the lorikeets. Enjoy your day and the week ahead! What handsome and colorful parrots! You never know what might come out of an old hole. Colourful house hunters ... lovely series Mick. I laughed out loud, causing the other person in our tiny house to ask about the joke! We both loved the post. You guys are so lucky with these gorgeous (although picky) backyard birds! such an interesting tree. 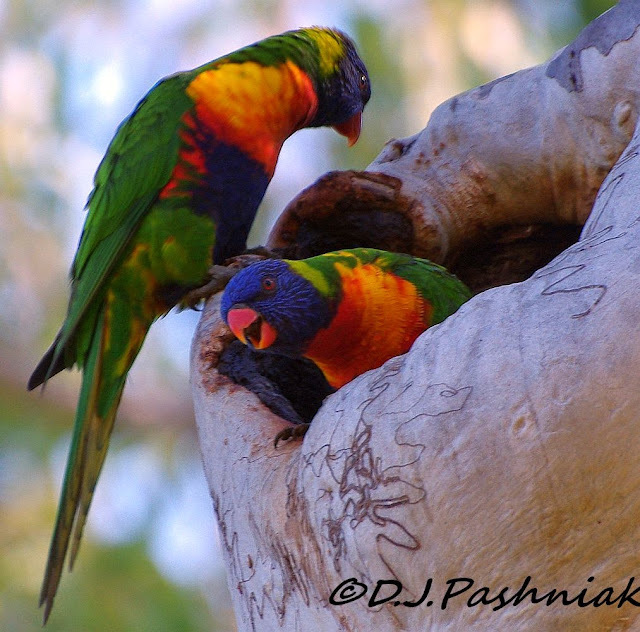 And your Rainbow Lorikeets seem to like it too. Its that time of year I think - lots of activity in some of the older street trees in my area too.